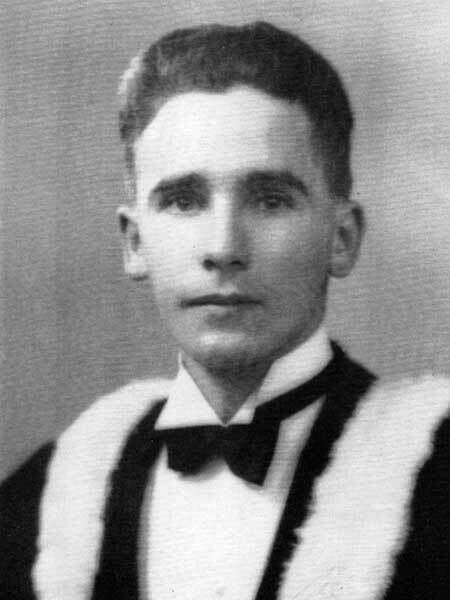 Born on a farm in the RM of Lorne on 12 June 1912, son of Alexander Fraser and Birdie Evelina Holliston, he was educated at Altamont School, United College, and the Central Normal School. In 1932, he began teaching at Deerwood School, moving the following year to Altamont School where he served as the Principal (1936-1939). While there, he attended university and received a BA degree. In 1939, he joined the Fort Garry Horse, went overseas in 1941, participated in the D-Day invasion in 1944, and saw active duty in France, Belgium, Holland, and Germany. He rose to the rank of Captain and received the Military Cross for conspicuous gallantry. He remained in the military following his return to Canada and served at the Royal Canadian Armored Corps School at Camp Borden, Ontario. In 1948, he was selected to attend the British Army Staff College at Camberly, England. He later became a staff officer at Carleton College and, in 1951, he was promoted to the rank of Major and joined the staff at the Armored Corps School in New Brunswick. After his retirement from the military, he returned to civilian teaching at the H. B. Beal Technical and Commercial School at London, Ontario. He and wife Linelda May Hepburn had three children: Dorian Fraser, James Fraser, and Evelyn Fraser. He died at London, Ontario on 6 May 1988 and was buried there. “Quits Army for London school job,” undated newspaper clipping. This page was prepared by Ina Bramadat and Gordon Goldsborough.